Carlo Seychell was born on March 12, 1949 in Pietà. He started his football career at the age of 14 with Valletta Vanguards from where he graduated to Valletta FC's junior strings. He made his first-team debut on October 1, 1967 as a substitute for Josie Urpani in the league match against Hibernians. This however, was an isolated appearance for the youngster and it was not until 1969-70 that he finally established himself in the first team. Seychell soon caught the critical eye of the City supporters and during that season he made six league appearances. He also scored his first goal for the Citizens in the secound round 1-0 victory over Hibs. He kept his place for for the FA Trophy, scoring two goals in the 5-0 victory over Gzira United in the quarter-finals. During the next few seasons, Seychell together with Vince Magro became the 'darling' of the City crowd. His spurts down the left wing electrified the crowd. 1973-74 was the start of a great era for Valletta. 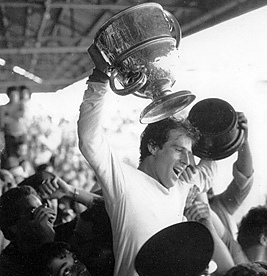 Between 1973 and 1980 the Citizens won the league championship and the FA Trophy three times each. Although not a pure striker, Seychell scored 50 goals for Valletta in 177 league appearances. 1974-75 was probably his best season, scoring nine league goals and finishing secound in the top scorers' list behind Ray Xuereb of Floriana. 1977-78 was a glorious season for Valletta. Seychell played in all 18 league matches, leading the team to the league championship. His fine form continued in the FA Trophy. He notched a hat-trick in the quarter final against Msida St. Joseph's. He scored against Marsa in the semi-final and was instrumental in Valletta's 3-2 victory over arch-rivals Floriana in the final. Seychell now had the world at his feet and he continued to reign over the City clan up to 1982 when he was surprisingly transferred to Hamrun Spartans. Valletta's loss however proved to be Hamrun's gain. Seychell went on to win his fourth championship medal and help the Spartans to win their first championship in 38 years. Luck deserted him midway through the season. He suffered a serious injury which eventually forced him to retire from the game. Seychell had a distinguished international career. He played 22 times for Malta and 14 times for Valletta in European competitions.